I asked one of Azanian Sea's readers, Anne Chappel, who is one of Abdulrazak Gurnah's biggest fans, to review one of his works. Here is her review of Admiring Silence. 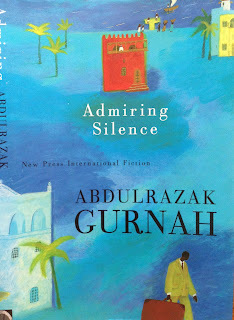 Admiring Silence, published in 1996, is Abdulrazak Gurnah's fifth book. It is a story of loss. And a story of stories: of the many layers and inventions created by the unnamed story teller as he travels between Zanzibar and the UK. We start with him in physical pain, a pain that 'reeked of loneliness and terror'. From this introduction we hear his story; of the culture shock of hisUK arrival, his successful studies, falling in love with Emma and having a child with her. He then recounts the story of his childhood in Zanzibar and the fleeing of the island after the revolution – an account that is later changed. Place and memory are of great importance as they inform us about the narrator as he struggles to find a sense of home. He is unhappy in his adopted country, which he has come to know through the woman he loves and through his gruelling teaching job. Nor is he at home in the country of his childhood where he chooses to hide the facts of his English life until it becomes a family crisis. At one stage he says, 'As if I was not already lost and stolen and shipwrecked and mangled beyond recognition anyway'. The narrator weaves fantastical ‘colonial’ type stories around himself, both for protection and to mock the xenophobia of Emma's father. Likewise, the stories he tells Emma about his past, are twisted and fabricated. 'I was allowed so much room, that I could only fill it with invention’. His ‘alienness’ is important to Emma (she uses it to get back at her conservative parents) and once the baby comes his only way to get attention from her is to act the fool. The stories have run out. When he returns to Zanzibar he is overwhelmed, 'I felt my eyes watering at the clarity of memory which had preserved these pictures so effortlessly, without renewal or exertion’. He now tells us a different story of his childhood. His dissembling continues: he does not want to reveal the details of his life in London; his common law wife and teenage daughter. Faced with his family’s delight at his homecoming he treads the line of least resistance. 'I was keen not to be seen to have changed beyond recognition, not to be thought alien.' And he seeks out from his mother another story – of what happened to his father, who left the family before he was born and caused shame to the family. His family had stayed behind and suffered through the days of hardship post the 1964 revolution. He is invited to visit the Permanent Secretary to the Minister of Culture. 'They were at ease with one another and with themselves.' He has lost this comfort, so he performs and mocks them in their ‘stolen’ houses. The strange job he is offered and declines is to translate the great books of the western world. Meanwhile, he dallies with his mother’s plans for him to marry a girl half his age (a girl also trying to escape her lot in Zanzibar for educational purposes). But he knows that it cannot be, for he is already committed. The elegance of the language draws you into the many layers of Admiring Silence as it takes you on these humourless wanderings. When our narrator returns to London, having been told that he is 'lost' to his Zanzibar family, he is further lost as Emma leaves him. And that is when he comes to occupy a 'fragile silence'. Maybe in this silence he will come to find comfort in who and where he is. For on this final occasion he does write home to share his sad news. Maybe a fragile truth is emerging. We are not to know. Admiring Silence appears to be a simple story, not much momentous happens and yet it covers a wide complex canvas and raises interesting issues. One of them is the return of a prodigal son to his homeland that has changed and suffered so much in the twenty years since his departure. ‘You should have brought us (rice and sugar)…instead of the chocolates and bottles of perfume’, his sister complains. The sewers are blocked, water and power intermittent. Roadblocks, corrupt police and politicians are facts of life. Gurnah's language is luminous, simple and powerful, almost poetry at times. He has an ability to speak of the heart, revealing people in all their rawness. You can open this book at any point and be enthralled. Anne Chappel was born in Mwanza and grew up in Tanganyika where her father worked for the British Government. In 1956 the family moved to Pemba and then Zanzibar where they lived until the January 1964 Revolution. She went to university in Natal, South Africa and studied Politics & Economics and then obtained a teaching qualification. She then did a second degree in Commerce and specialised in computers. This led to a career in Business Modeling. In 1987 Anne moved with her husband to Australia and she is now retired in Adelaide, South Australia. She is a keen student of African history, in particular the history of Zanzibar. Over the years Anne has written many travel articles for newspapers and magazines - recently for the East African in-flight magazine on various aspects of Zanzibar. Short stories and a local history book have been written and published and she is now working on the biography of her father and a novel set in Zanzibar.